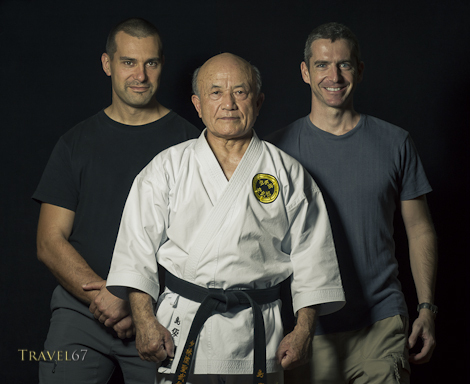 Thought I’d show a few behind the scenes shots from the latest Karate Masters Portrait Project shoot with Shimabukuro-sensei. We assemble our mini studio inside the dojo of each master. I have a Profoto 7A power pack which plugs into the mains and then a single pro-head inside a beauty dish for light. Behind the karate master I set up a large Lastolite Skylite with black velvet to give a clean background, and so the look of the images will remain constant throughout the entire project. I use the Pentax 645D camera with a 150mm lens and mount this to a tripod, although some shots are handheld. James holds the light and moves it from side to side depending on the stance of the karate master. The flash is triggered by a Pocketwizard remote trigger on the top of the camera, that signals another Pocketwizard that’s attached to the power pack. 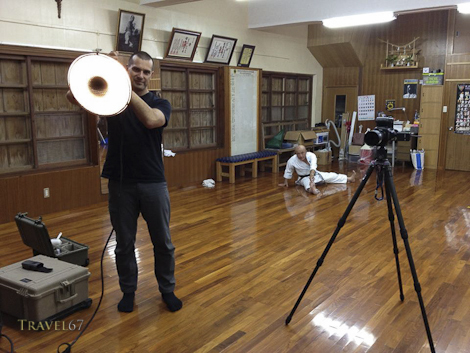 Posing with the camera, while the karate master is clearly not in front of me, but stretching in the background! I take a couple of simple headshots and then we ask the karate master to adopt their favorite stance or show their favorite technique. My job is then to try and keep up with the action, as unsurprisingly they can unleash a flurry of blows and kicks before I’ve managed to get them in focus. James will be testing for his second dan black belt next weekend. In another thirty or forty years maybe he’ll be the subject of a shoot, until then we’ll continue photographing these amazing Okinawan icons. 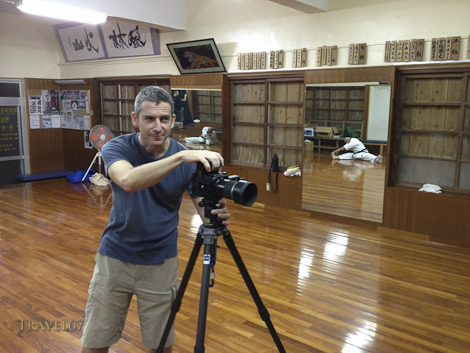 I appreciate the effort you go through to set up and take these photos as we brought the equipment from the US (left it in the dojo for six months and made two trips to Okinawa) and had 5 days of photo shoots to capture the photos needed for the 1,253 color photos in the Seibukan book. We took over 8,000 shots and Zenpo Sensei reviewed each one to get the right photo for each posture of the kata and basic techniques. The book sales have exceeded our expectation since releasing in June. I will get a copy to James for the Dojo Bar shortly. Thanks again for your effort to capture the images of all the senior teachers on Okinawa. If there is anything I can assist you with please let me know.